HSWA will be hiring a contractor to replace 6400 LF of 8" water main on Old Beford Pike and Centennial Drive. Please view the map for more details. The contractor is finishing up on this project. Crews will be working on restorations and final clean up this week. Thank you for your patience during this project. Contractors will continue to work on customer services the week of May 15th. The water main is installed and the tie in is complete. Contractors are currently working on installing customer services and will continue with customers services the week of May 8th. Contractors are still working on installing the water main on Leisure Ave. It will be necessary to shut off the water main to sections of Freedom Ave, LaFree St and Coldren St on Monday, May 1 for the water line tie-in. Customers affected will be notified by phone of this shutdown. Contractors should be finishing up the main installation early next week and be starting on customer services later in the week. 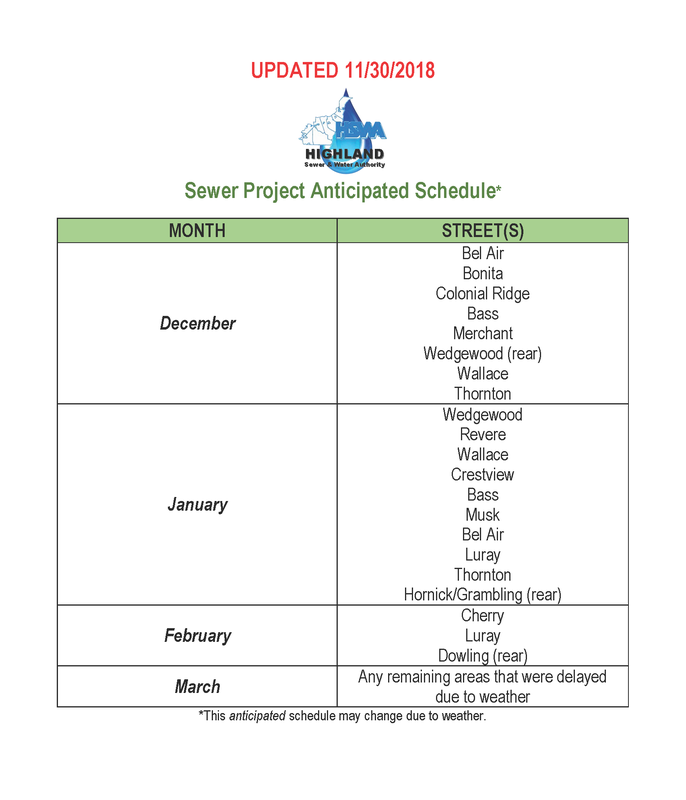 Contractors began work on Monday, April 17th on the water line on Freedom Ave.
Highland has hired a contractor to replace the water lines on Leisure Ave, Freedom Ave and Clermont St. The contractor broke ground on Monday April 17th and construction will continue for approximately 3 - 4 months. Please note that all restoration will be completed by the contractor. Also, customers will be notified via telephone of any planned waterline shutdowns that will occur during this replacement project. Update your contact info today!